Not all of Deep Creek’s mile-long tubing course is fast-moving water. At the end of the upper “whitewater” section, Deep Creek widens at a deep swimming hole that provides a refreshing pause from tubing. 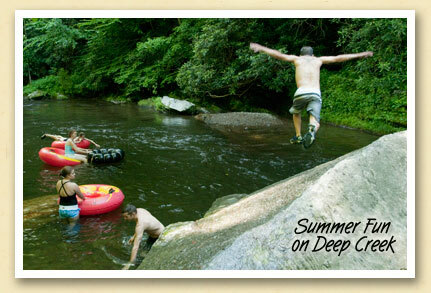 The Deep Creek Recreation area is just inside the Great Smoky Mountains National Park, two miles north of Bryson City. There’s camping, picnicking, hiking trails, trout fishing and three beautiful waterfalls. Tubes can be rented from several vendors near the park entrance. Where else can you have a day of great fun for less than five bucks?